Frau Schmitt and I go everywhere and do everything in New Orleans. There are few places we haven’t been. We are known all over town in ‘good’ parts of New Orleans as well as shady one. Everyone is friendly. We’re all New Orleanians. 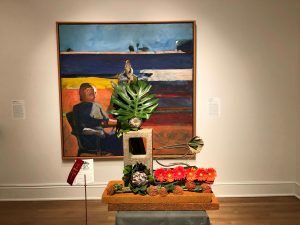 Art in Bloom is a New Orleans state of mind in this city where everyone is creative and culture flourishes, densely woven and richly textured, every day and in every way. Art in Bloom is a show that happens every year at the New Orleans Museum of Art (NOMA), which is the art museum at the end of our street. It is about a half-hour’s picturesque stroll from our front door. Art in Bloom is an exhibit of flower arrangements that are set up for one weekend every year. You never know what you’re going to find when you visit New Orleans. That’s why you stay at La Belle Esplanade. We’re here to tell you about things off the usual tourist radar. California realism and a flower arrangement on a beautiful New Orleans day. A New Orleans moment. A shotgun house draped with flowers in front of a Renaissance painting. It’s not an Arp in the background. It’s not a Miro It’s not a Kandinsky, either. I forget who painted that picture. My favorite of the late surrealist painters has always been Matta. Get your good self down to New Orleans to discover and explore the many surprises this wonderful city we call home holds. There is always something going on in New Orleans, even when you think nothing is going on. If you are bored in New Orleans, you must have a hole in your imagination. No one ever says their visit to New Orleans too long. It is always too short because the longer you are here, the more you’ll realize how much more there is to discover and explore. I always say that five nights is the perfect amount of time to get a satisfying taste of New Orleans. More is always better. Follow us on Facebook to keep yourself in a New Orleans state of mind. We post on Facebook 2, 3, 5 times a day whatever your humble narrator happens to come across over the course of my day. Much like this blog, our Facebook page is “sometimes informative and usually entertaining.” Welcome to my world. Sign up for a newsletter at the bottom of this page. Have a great New Orleans day today! We look forward to meeting you. …ranked the #1 place to stay in New Orleans and in Louisiana, #2 in the U.S., and the #16 place to stay in the whole world. Monday, April 8, 2019: Frau Schmitt and I went to Maypop the other day. The chef thanked us for all the people we send their way. This is a restaurant based on the concept of Southeast Louisiana meets Southeast Asia. The food is delicious. You won’t read about this place in any guidebooks even though the chef has been nominated for a James Beard Award for at least three years running. New Orleans is full of surprises. Let us help you discover a few of them. New Orleans is full of unexpected surprises. New Orleans is Full of Details — Eat Well in New Orleans.